Police officers are equipped with lots of tools. Guns. Tasers. Batons. But how about a needle and thread? 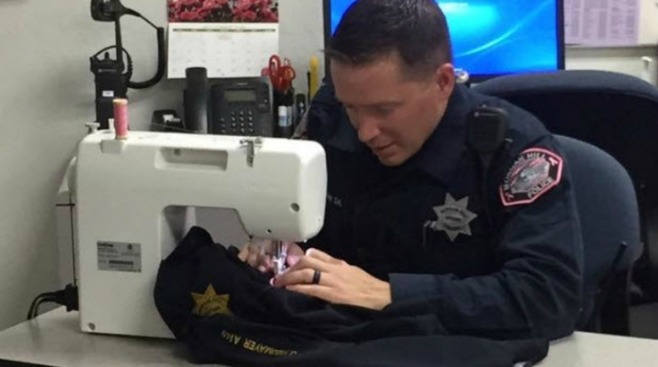 One Morgan Hill police officer took to his Singer this week to sew on pink patches to promote breast cancer awareness for himself and his buddies in blue. On its Facebook page, Morgan Hill police wrote: "He does it all. This is not a fake picture. Officer Woodrow is actually sewing pink patches on MHPD uniforms" to take part in the Pink Patch Project. "Thank you Seamster Woodrow." Chris Woodrow, who was not available for immediate comment on Tuesday because he wasn't on duty, received rave reviews, mostly from women, who admired his mad sewing skills. "Renaissance man," Whittney Williams wrote on Facebook. "That is too awesome," Lucia Smith-Ochoa wrote. Even his mama got some love. "Kudos to Woodrow and probably his mom who taught him," Janis McDonald posted. Actually, Sgt. Carson Thomas told NBC Bay Area in an interview Tuesday that Woodrow learned to sew while doing theater in Ireland, where he's from. "He's going to hate me for saying this," Thomas joked about Woodrow's past life. But when the patches arrived at police headquarters for the collaborative cancer awareness fundraiser, Woodrow piped up that he could help sew them on the uniforms. He's done 10 so far, and hopes to put on 40 by the end of the week. At first, the guys teased him about his "hidden talent," Thomas said. But by the end, everyone was saying, "this is great." As for the patches, Thomas said the police department wants the public to know that officers are not just about enforcement, they're about community-building, too. This is the first year Morgan Hill has participated in the breast cancer campaign, selling patches for $10. All proceeds go to fight breast cancer. Morgan Hill is holding a patch fundraiser called "Putting the cuffs on cancer" on Oct. 17 at 10 a.m. at 6633 Eastern Ave.